Retirement can be an opportunity for rebirth – a time to set in motion a new chapter in life. It would even be regarded as an opportunity for a career restart. Retirement is when we have more of that precious commodity…free time! It is when we can take the opportunity to learn something new that can stimulate us. Unfortunately many of us have fallen into society’s pattern for our lives – working and being productive. Sadly, that is to be productive according to society’s definition of success, not ours! There has to be more. This belief is difficult to dismiss when spending hours in a perceived unproductive mode while indulging our interests. We thus have to make sure that those interests will captivate our spirit and drive us to live a full and satisfied life. Many of us considering retirement are weighed down by important questions before making that life changing decision. We wrestle with many questions: Is it time to retire? Can we afford to retire? What will we do to occupy our time after retirement? We need to find creative ways to enjoy life or pursue an alternate career while maintaining a healthy and balanced lifestyle. More time on your hands will allow you to wander and experience the wonders of our world if you can afford it. We do however have to keep our expectations in line with the reality of our financial circumstances. Family responsibilities often play a role in how we manage our time. Caring for others, such as your children, grandchildren or elderly parents may require obligations and place demands on your time. These responsibilities can be satisfying despite the challenges and frustrations that oft time seem to accompany engaging with family. Social interaction with family can, however, be a rewarding experience. It could ease the sense of isolation that some retirees experience. Emotional health is equally as important as physical health, especially at this important chapter of our life. As we contemplate how to spend time, hesitation and even some confusion can become obstacles to implementing a good plan. That concern can be lessened by doing research at the library. Libraries offer great free resources, as do colleges that have continuing education courses. The library is an excellent resource as it provides access to a range of helpful information on how to have a fulfilling retirement. There are also local community centres, clubs, and social groups that provide networking opportunities to ease one into the restart. Workshops and classes can open many avenues in making retirement more productive and enjoyable. We have an opportunity to link up with all kinds of people in various age groups and from a vast array of cultural backgrounds. If you are interested in the arts you can take classes to learn how to draw, paint, write or even learn to play a musical instrument or anything else that may inspire or interest you. A second career is also considered by some of us. This option may or may not offer a salary especially if you are a volunteer. That choice might depend on your financial circumstances. Volunteering in community centres or becoming a member of a social group can help you keep busy and give you a sense of being productive. While minimum wage jobs may offer some type of obligation, they may not sustain you emotionally. Your spirit or psyche might need more. There is the option for entrepreneurship for those who have the determination and passion to set up their own business. Establishing a business is challenging so lots of hard work and resilience will be essential. Enjoying retirement often has more to do with the choices we make, like embracing hobbies. Finding a hobby of interest is another activity to consider. If you choose what you enjoy, the surroundings will fall into place. It becomes the most important calling. Activities of interest can help to ignite the restart as you carve out your destiny at this time life. You know you are on track with your destiny when you feel alive —that special spark that harks back to your youth. During this time you will find that your purpose changes with life experiences and with age. This restart can be a most enthralling experience that you can explore and enjoy. The sky is the limit …. the fire of youth may have receded, but the passion should still be there in the embers. This entry was posted in Career restart, Health, Retirement, Retirement careers, Retirement hobbies, Volunteerism and tagged Career restart, Retirement careers. Bookmark the permalink. Thought provoking and informative. Interesting external links. Very good article, enjoyed reading it. 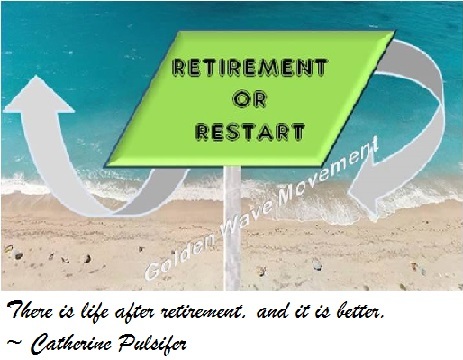 Yes, I agree “Enjoying retirement often has more to do with choices we make.” We can choose that retirement is not the end but the beginning of living life, i.e. spending more time with family and friends, traveling, reading the books you always wanted to read but never had time. Hope, we also can choose to retire as early as we can so we can enjoy life. Instead of working all our life and dying on the job.